Bike is in great condition! It needs a home where it can be enjoyed. It belonged to my late husband. 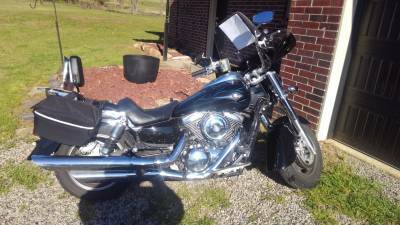 It has a fresh oil change, fresh gas, new battery, lots of extras- new cover (sitll in box), new riding gloves, 2 saddle bags, helmet with light on the bag and air vents for keeping your head cool, camo cup holder, exrta seat and bar on back of seat. Will only take cash - no checks!